Today was another sea day, and the weather has been steadily improving. We did the breakfast buffet again this morning, then I snagged a cup of coffee while we waited for the vegetable carving demonstration to start in the Piazza. It was really interesting to watch, and he worked a lot faster than I thought. From what they said, the ship has two carvers, a junior and a senior, who do all of the fruit carving, ice sculptures, and more. We did some more exploring and laps around the promenade in before lunch, and then went up to the buffet to have some sushi. After lunch, since the weather was so nice, we grabbed some fruit smoothies and a couple lounge chairs and sat out, enjoying the sun, for a little while. After that, we went down to our cabin and got dressed for dinner. When we got in to our cabin on Saturday, there was some paperwork waiting for us, including our excursion tickets and a card to present to the head waiter for our honeymoon surprise. We decided to do it tonight, and got a table for two instead of sharing a larger table. After dinner was done, our waiter and a few of his accomplices came out and sang happy anniversary to us, set to the tune of happy birthday. They also brought us a piece of chocolate chocolate cake, which was rich and delicious. Due to the cake, we did a few extra laps around the ship after dinner and then turned in early. We’ll be in Roatan tomorrow and have a shore excursion booked, so we need to be up and moving pretty early. 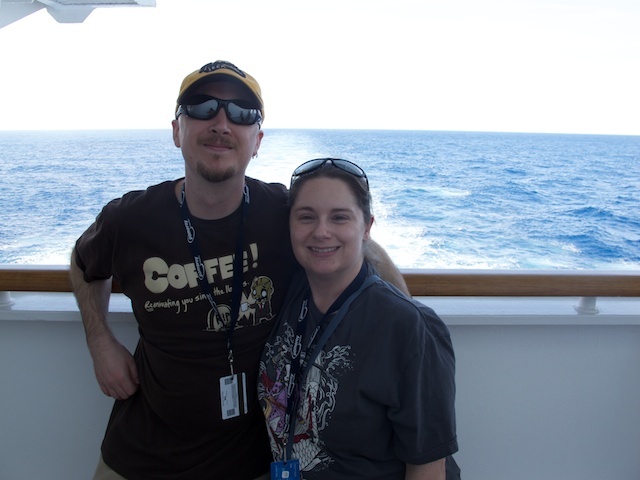 A friendly passenger took a picture of us at the back of the ship.